In the year 2018 AD of an alternate universe, we are well into the fallout of a nuclear war between North and South Korea. Law, order, and a functioning society have been wiped from the landscape. Resources are scarce and food is very hard to find. Millions have starved to death, but remarkably, a few have managed to thrive. Sightings abound of people in strange outfits roaming the countryside. Traces of traps have been spotted all over, some clearly not just for animals. Disappearances among the living increase, and whispers of a place known as The Bunker intensify. Little is known of The Bunker, but some say it has decontamination facilities; a tremendous advantage in these conditions. It is believed that the people in strange outfits, the traps, and The Bunker are all linked, but for what purpose remains a mystery. ​All that seems certain is those who are captured have one hope of surviving; escape during the decontamination process. A process that can take less than an hour or could exceed three. Captives would have to forgo decontamination for a chance to flee. If you get abducted, act fast! 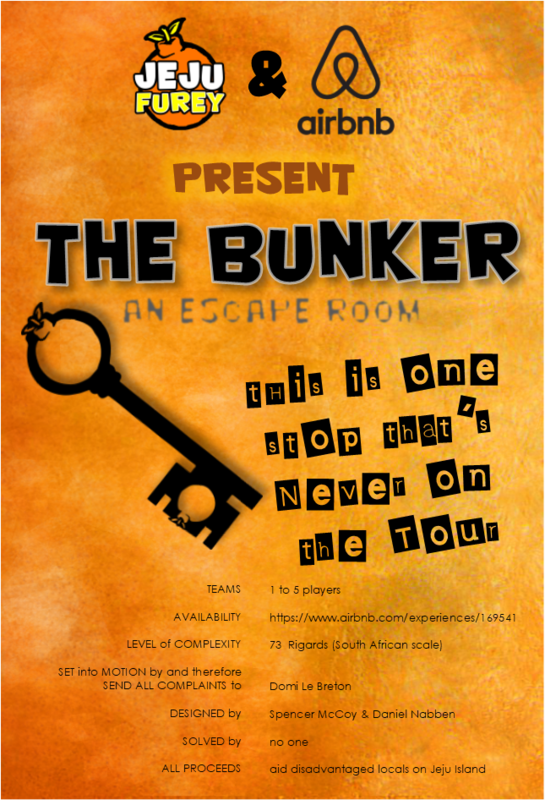 Don’t wait to find out what will happen to you in The Bunker! There is no set time limit. 2. Why no time limit? (a) we believe the fun of escape rooms lies more in solving the puzzles than doing so with speed. (b) commercial escape rooms set a time limit to be able to process more groups, but since this room is purely for charity and our hosts volunteer their free time to offer it, we are not subject to the limitations and necessities of a normal profit-driven business. 3. Do I need to be able to read Korean? No. Having zero ability to read Korean will not hinder your ability to escape in any way. 4. How well do I need to be able read English? Quite well. You do not need native-speaker fluency. Non-native speakers have managed to escape but their levels were high-intermediate-to-advanced.